Hornby Magazine made a big impact in the model railway magazine market when it was first launched by Ian Allen. The magazine filled a gap in the market to cater for the less experienced modeller. 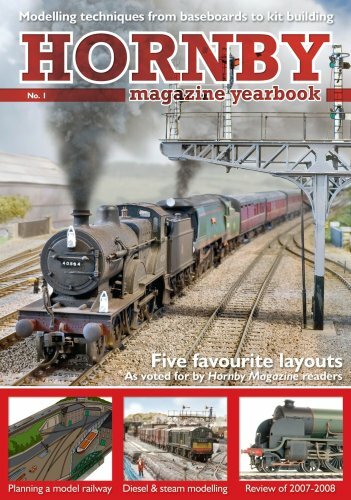 Hornby Magazine Yearbook No 1 provides the highlights from the first year of the magazine of the same name, providing a combination of the most popular features and the best layouts featured during the year. Mike Wild has provided some great material and there is plenty here for both beginner and advanced modeller. There are features on planning a layout, and the top 5 layouts as voted by readers of the magazine appear once again in print. However there is no new material, only reprints of articles already published. Subsequent yearbooks addressed this following extensive feedback from readers. If you didn’t buy Hornby Magazine in 2008 then this yearbook is a worthy way to catch up. If you have the magazines already beware duplication.